A tornado slammed a southwestern Louisiana town Saturday, killing a young mother who was sheltering her child. 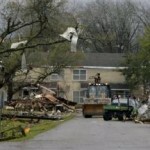 Eleven other people were injured and more than 100 homes were damaged, many of them destroyed, authorities said. About 1,500 people were evacuated because of natural gas leaks. Debris was littered throughout Rayne, a town of about 8,500 people, after a line of violent thunderstorms moved through the area and left behind a swath of damage about a quarter of a mile wide to three miles long. 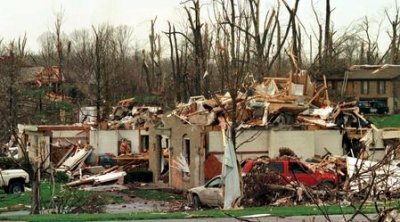 Pieces of homes were strewn about the tops of trees, and power lines were down. A U.S. Postal Service truck was flipped to its side. The natural gas leaks, which were later fixed, delayed authorities trying to count how many homes and businesses were damaged. About 1,500 people were ordered out of the area for the night, she said, because officials feared more gas leaks could occur. A temporary shelter was set up at a fire station – about two dozen displaced persons were there Saturday night – and officials were working to find other shelters. A curfew was imposed for the storm-damaged area and will remain in effect until at least 6 a.m. The National Weather Service sent a team to investigate and confirmed a tornado had struck the area.